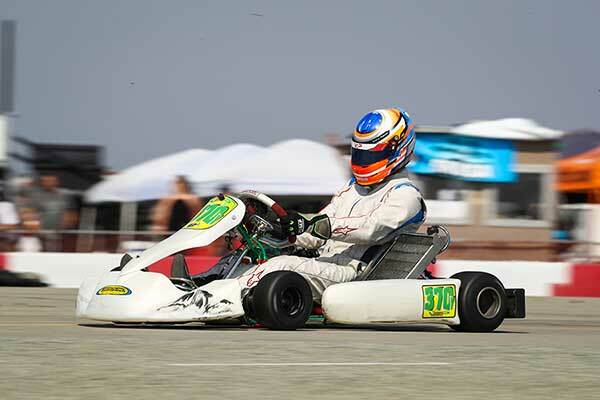 Billy Musgrave has won throughout the season in California PKC and SKUSA Pro Tour competition – in the S1 division. 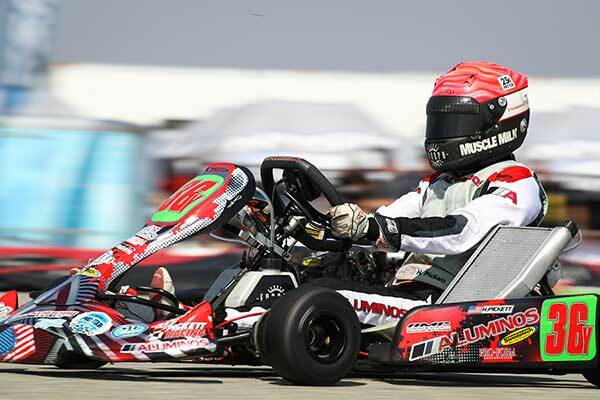 Round Five in the Formula Works/CompKart X30 Senior was Musgrave’s first triumph in the category. 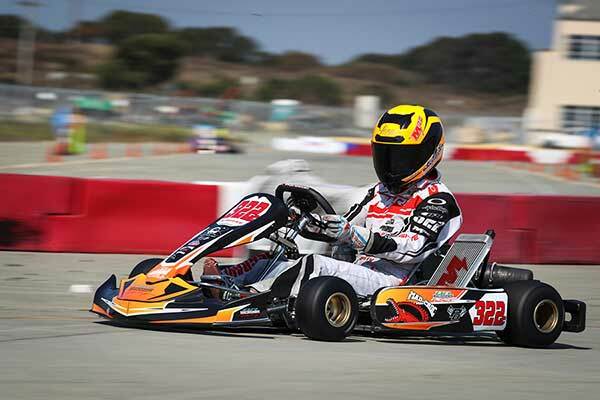 He began the event with fast lap in qualifying (39.565), edging out defending champion Nicky Hays and Michael Avansino by 94 thousandths of a second. Musgrave was unable to take the green flag in the opening heat race, thus allowing Hays and Avansino to run 1-2. In Heat #2, Musgrave climbed his way in the 12-lap event, charging from the back to end up reaching the front by lap 11 to score the win. Musgrave was shuffled back to fifth at the start of the main event as Hays jumped to the lead. It would not take long for Musgrave to reach the second spot, and hound Hays. Lap 12, Musgrave took over the lead and from there, drove away to a 2.2-second margin of victory. Hays recorded a solid day toward his championship bid placing second, with Jacob Gulick earning his first podium of the season in third. Andrick Zeen and Alejandro Marquez rounded out the top-five. 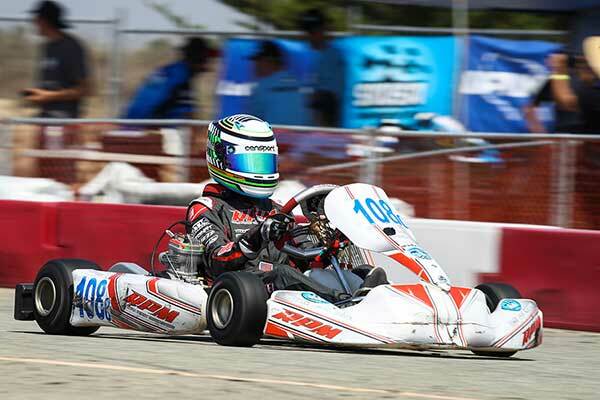 Musgrave nearly pulled off the double, missing out on the victory in the Vemme Kart S1 Pro Stock Honda division. Fast time in qualifying (38.359) put him on the front row for the opening heat race. Musgrave led the opening heat wire-to-wire, duplicating the feat in the second moto with Hunter Pickett on his trail. Musgrave took the holeshot to begin the Final, and this time Pickett did not hold back. 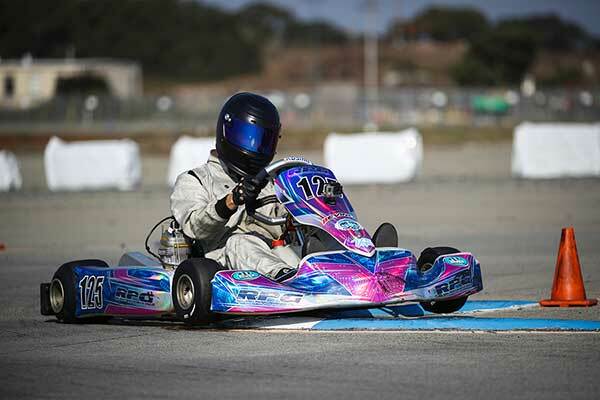 Pickett, a winner at the SKUSA Pro Tour WinterNationals, jumped ahead of Musgrave on lap 13, holding the position to the checkered flag for his first California PKC victory of the season. Musgrave settled for second, with Round Four winner Matias Podboj rounding out the podium. Hunter Kelly ran fourth. Four drivers were able to sweep the action in Marina, including last year’s Phil Giebler Racing X30 Master champion Mike Rolison. The 2016 champ returned back behind the wheel, piloting to a perfect day in Round Five. Rolison set fast time in qualifying and was challenged by championship contender Travis Irving there after. Fighting off Irving in the opening heat for the win, Rolison went green-to-checkered in Heat #2. Irving battled Rolison early on in the main event, until the former champ pulled away with fast laps of the race to a 3.6-second advantage after 20 laps. Irving placed second, earning maximum points among those in the title chase. Luke Vasquez joined them on the podium. Adam White and Tim Meyer finished fourth and fifth. Earning his fifth victory of the season, locking up the championship in the Musgrave Racing Company S4 Super Master Stock Honda division was John Crow. 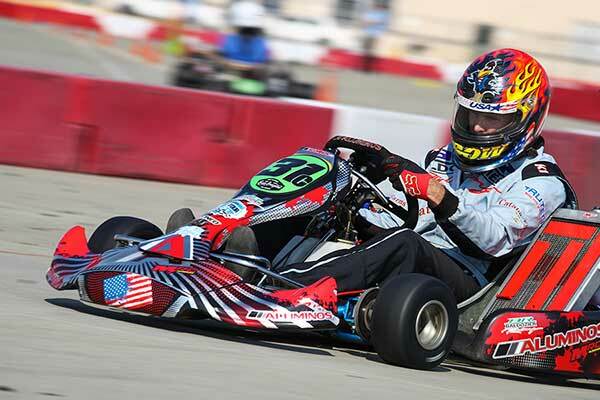 The unofficial new class champ completed his third straight perfect score sweep, dominating the day in Marina highlighted by a six-second advantage in the main event. Warren Kindberg and Jonathon Allen joined him on the podium, with Darrell Tunnell and Rod Streed completing the top-five. Rob Logan helped his cause for a championship bid with a sweep of the action in the Mike Manning Karting S4 Master Stock Honda class. Logan scored his second victory of the season after leading all on-track sessions for the day, extending his point lead heading into the season finale. Three drivers fighting for the second spot followed behind, led by Robert Marks at the end of the Final. Nick George finished third with Vivek Tandon fourth, as their battle will continue in Lancaster. Jacopo Pizzinato drove unchallenged in the Rolison Performance Group S5 Junior Stock Honda category. Kol Bailey added his name to the list of winners in 2017 with his first ever in the Mad Old Nut/Mad Croc USA S2 Semi-Pro Stock Honda division. Championship leader Jason Pettit set the pace throughout the day, leading qualifying and winning both heat races. Bailey was second after the timed session; however, contact put him on the sidelines on the opening circuit of Heat #1, while also retiring early in Heat #2. Bailey charged forward in the main event, hunting for Pettit. By lap 14, Bailey had caught and passed Pettit for the lead. From there, Bailey led to the checkered flag, extending out to a 2.3-second gap over Pettit. Robert Heck Jr. joined them on the podium, with Anthony Freese and Josh Early completing the top-five. 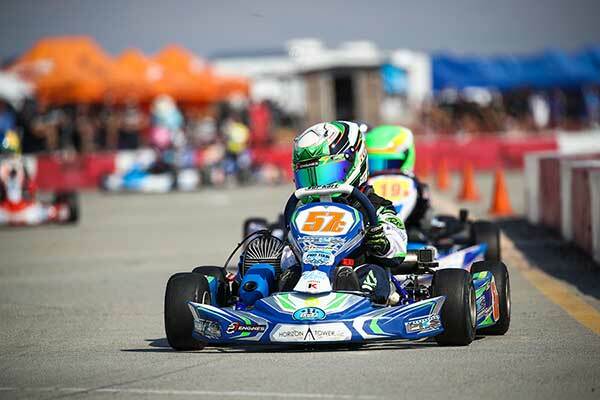 Ryan Perry Motorsport X30 Junior championship leader Trey Brown had a sweep on the day in progress for much of the event. Brown set fast time in qualifying, and won both heat races. Round Three winner Joseph Daniele and Jace Denmark-Gessel jumped early on the attack of Brown, relegating him back to third by lap three of the main event. Denmark-Gessel ran second until taking over the point on lap 13. Brown moved to second, slipping Daniele to third. 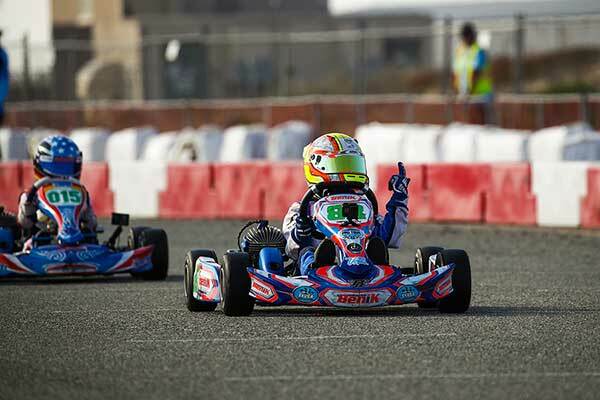 They would run that way to the checkered flag, with Denmark-Gessel scoring his first victory of the season. Brown ended up second with Daniele in third. Alan Tang and Edward Portz completed the top-five. Zach Pettinicchi scored his third victory of 2017 in the Nash Motorsportz S3 Novice Stock Honda class. Championship leader Keawn Tandon struck first, earning the 10 bonus points for fast time in qualifying, with Pettinicchi only 68 thousandths off. The holeshot for Heat #1 went to Pettinicchi, leading all 12 laps with a repeat performance in Heat #2. Pettinicchi drove away in the Final, going wire-to-wire in all racing sessions to the victory. Tandon finished second with Robert Tifft in third. Evan Jonker was fourth and Todd Ulman fifth. Carson Morgan extended his win streak to three in the Outsource Utility Contractor Corporation Mini Swift class. 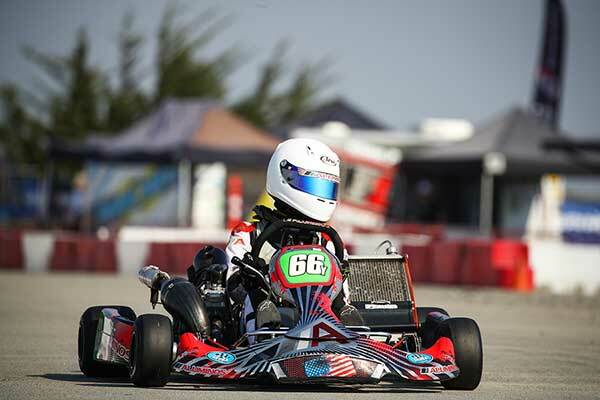 The 2017 SKUSA Pro Tour champion won his first event as the new champion, edging out the 16-driver field in Marina. Morgan was chasing Kai Sorensen in qualifying, who took the fast time by 96 thousandths. In Heat #1, Morgan was third in the order after Kasey Gillis took the win ahead of Daniel Inzunza. Morgan jumped to the lead on the opening circuit of Heat #2, leading all 12 laps before going wire-to-wire in the Final for the victory, helping his championship chances. Sorensen won the battle for second ahead of Gillis, with Inzunza in fourth and Josh Pierson fifth. 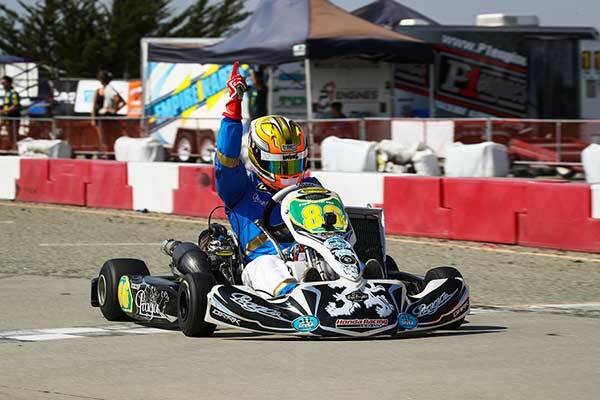 For the second straight event, Logan Toke ended the day on top of the PKS Kart Supplies Micro Swift division. Toke was one session away from a sweep, edged out by Enzo Deligny by one thousandths of a second in qualifying. Toke responded with wire-to-wire wins in the heat races. That was followed by leading all 15 laps of the Final for his second victory on the season, adding to his points total heading into the series finale. Deligny was a close second, earning fast lap honors in the main event. Parker DeLong was third, with AJ Zarcone and Ryan Persing finishing inside the top-five. 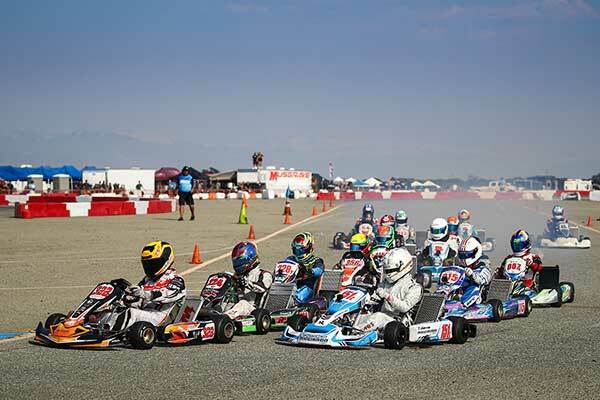 It will be a quick turn-around for the competitors of the California ProKart Challenge as they return to action on September 30-October 1 at the growing Streets of Lancaster Grand Prix. 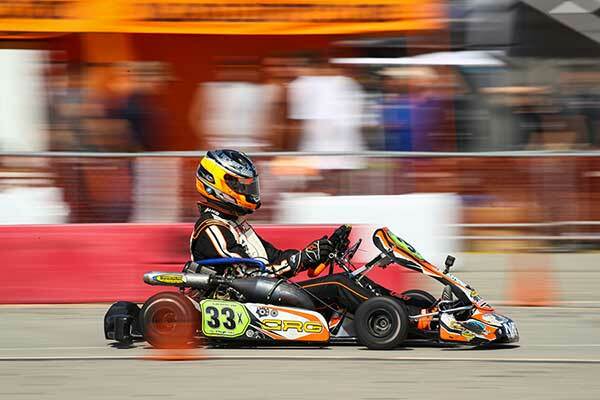 The two-day street race festival has been the site of the series finale since 2012, and continues to welcome top karters from all over North America. Registration is currently open at the MotorsportReg.com SKUSA link, with details about the event coming together on the Event Pages. The Mains for the S1/S2 race group and X30 Senior are scheduled to take place under the lights on Saturday night like in 2016.